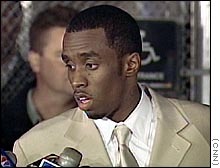 NEW YORK - The jury in the trial of rap mogul Sean "Puffy" Combs has found Combs not guilty on all five counts of gun possession and bribery. Combs lowered his head as the verdict was read and was gathered up in a bear hug with his attorneys, Johnnie Cochran and Benjamin Brafman. The was brief applause in the courtroom and Combs mother, Janice, shouted, "Thank you, Jesus!" and blew her son a kiss. Outside the courthouse, Combs said, "I feel blessed." He thanked God, his mother, and the "people out there, the fans, the people of New York who showed their support." Sean "Puffy" Combs: "I give all the glory to God"
Sean "Puffy" Combs: "I'm just really emotional. I feel blessed"
Combs' bodyguard, Anthony "Wolf" Jones, was also acquitted on similar charges. Co-defendant Jamal "Shyne" Barrow, a Combs prot�g�, was found guilty on assault and reckless endangerment and weapons charges, but acquitted of attempted murder. The seven men and five women reached their verdict on the third day of deliberations. They had been sequestered during their deliberations. Cochran said the verdict was a "great, exhilarating victory." He said the wait while the jury read its verdicts on the multiple charges against the three defendants was "unbearable." Brafman told the reporters he felt he had "won the Super Bowl." The charges stemmed from a December 27, 1999, shooting that wounded three people at Club New York, a popular Times Square nightclub. Combs was at the club with singer Jennifer Lopez, who was his girlfriend at the time, Jones and Barrow. Witnesses testified that Combs and Lopez were leaving the club when another patron threw money in his face. Prosecutors say Combs and Barrow pulled out handguns and opened fire in response to the insult. Combs was not charged with firing a weapon. Barrow was arrested as he fled the club with a gun in his waistband. His attorney said that Barrow did fire a gun in the club, but said he felt his life was in danger. Combs, Lopez and Jones left the scene in Combs' Lincoln Navigator and were stopped by police several blocks away. Combs and his bodyguard were arrested. Lopez was not charged. Assistant District Attorney Matthew Bogdanos said Combs threw a 9mm handgun out a window of the SUV that was recovered on a Manhattan street. In his closing arguments, which lasted almost six hours, Bogdanos said the gun was almost identical to another weapon that was found under a seat in Combs' Navigator. Bogdanos said there was "a 99 million to one chance" that guns so similar could be found at random. Prosecutors also alleged that Combs offered his driver, Wardel Fenderson, $50,000 to say that the gun found in the vehicle was his. Fenderson testified that he told police the gun was his, but that he changed his mind after talking to his attorney. Combs testified he did not have a gun at the nightclub and did not know anything about the gun found in the Navigator. His attorney said that Fenderson changed his story to avoid getting in trouble. Prosecutors said five different witnesses saw Combs with a gun on the night of the shooting, including two of the victims. In closing arguments Monday, the defense argued that Combs was the victim of people seeking to profit from his fame and fortune. Several separate lawsuits have been filed against Combs in connection with the lawsuit, with damage claims topping $1 billion. All three of the wounded have filed multimillion dollar lawsuits. Natanya Reubens, 30, was hit in the face, and still has seven bullet fragments lodged in her head. Robert Thompson, 39, and Julius Jones, 27, were both shot in the right shoulder. Combs has created a business empire around rap music. His record label, Bad Boy Entertainment, brings in between $40 million and $60 million a year and his Sean John clothing line brings in about $100 million. Combs also owns two restaurants and is considering branching out into movies. CNN Entertainment Correspondent Michael Okwu, CNNfn Correspondent Susan Lisovicz and Reuters contributed to this report.